BANGI, 26 Nov 2013 – Climate change and human activities are speeding up modifications to the coastline of littoral nations in the South China Sea area which might adversely affect those leaving near the sea. Researchers at a three-day international workshop on river sediments which opened here today agreed that in the shorter term, rapid development has altered the environmental balance of beaches and mangrove swamps. They also acknowledged that the impact of climate change in the longer term might permanently alter people’s way of life which could have economic implications. The researchers were delivering their findings at the opening session of the Sixth International Workshop on the Fluvial Sediment Supply to the South China Sea. 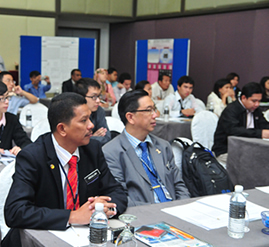 The workshop is organised by The National University of Malaysia (UKM) together with Universiti Malaysia Terengganu (UMT), the Ministry of Science, Technology and Innovation (MOSTI) and various partners in the private sector. Fluvial sediments are deposits formed by rivers which accumulate because the rivers can no longer carry them downstream. One of the scientists, Dr Edlic Sathiamurthy said UMT where he works would be underwater by the year 2020 if no action is taken to mitigate the effects of construction at the nearby Sultan Mahmud airport. UMT’s position is further compounded by silting at the estuary of the Terengganu River near Batu Burok, caused by expansion and construction at the riverside. Dr Sathiamurthy said the airport runway was being extended out to sea but was causing erosion or “massive retreat” of the coastline on the side adjacent to the UMT campus near Pantai Tok Jembal, while silting was occurring on the other side of the runway. He, however, said the Department of Irrigation and Drainage (DID) was carrying out a mitigation project in the form of breakwaters near Pulau Duyong off the coast in addition to the seawalls nearer to the university. Breakwaters are small man-made islands that reduce the effect of waves washing ashore. Another researcher, Dr Cherry Ringor from the University of the Philippines said climate change has brought increasing rainfall, which was causing the beaches of Batangas and other parts of North-western Philippines to recede. Dr Ringor, who does research for her country’s Institute of Environmental Science and Meteorology, said as far as human activity was concerned the effects on the coastline had not been as noticeable as climate change. She said Typhoon Hayan had not passed through the north-west, but the long term effects from storms was to cause erosion in some parts and sedimentation in others. She said that the Philippine government is implementing projects to grow coral reef off the coast to dissipate the waves and protect the shores from erosion. Nevertheless, she and her research team were monitoring the changes to the shoreline due to construction of coastal infrastructure such as houses and resorts. In Vietnam, Prof Nguyen Van Lap from the Ho Chi-Minh City Institute of Resources Geography said the rise in his country’s economic activity had brought far-reaching consequences to the coastline. Prof Lap said he and his colleagues noted that industries were sprouting along the Mekong River delta, while the long-term effects due to climate change had also made its mark. He said within the last 20 years mining, cutting down of mangrove trees and manufacturing industries had permanently altered the once gentle Mekong river. Satellite images showed the shoreline had changed considerably by both erosion and deposition processes at the active delta plain. The change in shoreline of the Mekong River delta were influenced strongly by monsoonal activity in recent years due to climate change and human intervention, Prof Lap said. Some 25 participants from seven countries in South-East Asia and China presented their research findings at the workshop.